Mapped from DEP Wetlands data: shrub swamp, deep marsh, shallow marsh, meadow or fen. 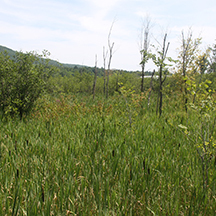 Non-forested wetlands include wet meadows, marshes and shrub swamps. Wet meadows are wetlands that hold surface water only for brief periods of the year but where groundwater? is at or near the surface creating the low oxygen conditions that define wetlands. They are characterized by herbaceous vegetation (grasses, sedges and forbs) rather than woody plants (trees and shrubs). In Massachusetts, these types of wetlands are transitional in nature and rarely persist in the absence of active management. In natural areas, they may occur where abandoned beaver ponds drained of water are colonized by herbaceous plants that will eventually yield to shrubs and then trees. In human managed landscapes, such as hay fields, pastures, and golf courses, wet meadows can persist for many years. Marshes are wetlands characterized by long periods of standing water; the length and depth of flooding generally being too long and deep to support woody plants. Typical plants of freshwater marshes include cattails, burreeds, pickerel weed, arrowhead, and wild rice. Freshwater marshes serve as important habitat for rails, herons, waterfowl, and amphibians. Shrub swamps are wetlands that are dry enough to support woody vegetation but too wet to support full grown trees. In many of these wetlands, woody plants grow on mounds or hummocks surrounded by standing water. Plant species typical of shrub swamps included buttonbush, alder, various viburnums and dogwoods, winterberry, sweet pepperbush, bayberry, leatherleaf, and stunted trees such as red maple.